Guitarist, singer and radio personality John Pizzarelli, 52, is one of the most entertaining and engaging performers on today’s jazz scene. In his new book, co-written with longtime collaborator Joseph Cosgriff, he recounts his life in music, and that life is indeed a storied one. He started playing guitar shortly after he began walking, and alternately cut his teeth performing the pop music of his youth and gigging with his swing-loving father, guitar great Bucky. It was a schizophrenic upbringing that he eventually resolved by creating his own modernist takes on standards. But being an outstanding performer doesn’t automatically mean you’ll write an effective autobiography. The challenge for the autobiographer is tone, a subtle but complex factor when it comes to self-expression. If you talk too boastingly about your accomplishments you come across as self-aggrandizing; minimize those same achievements and it seems like false modesty. Case in point: In the chapter describing his recording session with Paul McCartney, Pizzarelli struggles with balancing those contradicting tones. But it’s Pizzarelli’s reliance on comedy that stumbles most on the written page. Jokes and quips do not a book make. Humor writing is hard. 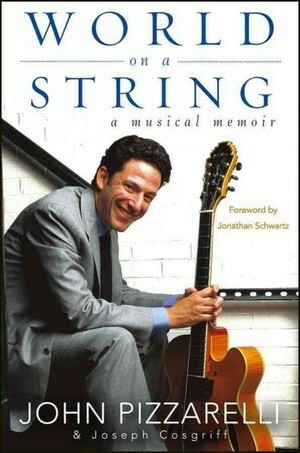 Pizzarelli, a natural comedian onstage, simply doesn’t have those writing chops yet to sustain whole chapters, much less a book, and he seems to be trying so hard to entertain us. When writing funny, less is more-much, much more. Even worse, when you try hard to be funny over and over with quip after quip, it can be tough to sell a deeper or more emotional passage: The reader comes to expect a punch line when there is only heartfelt emotion flopping on the page like some ill-placed non sequitur. It’s clear that this book would have benefited greatly from the work of a skilled editor. Literary craft aside, fans of Pizzarelli and mainstream jazz will find much to love here, thanks not only to the author’s colorful experiences but also to the deeper emotional expression that surfaces now and again. His chapters on his father and Rosemary Clooney are often poignant. And the chapter on touring as an opening act for Sinatra is the kind of personal and observational piece that you’d read in the New York Times or the New Yorker-clever yet touching. The more serious Pizzarelli is about his life, the more entertaining the writing.